Bind biotinylated oligonucleotides and peptides with higher binding efficiency than other commercially available streptavidin-coated plates. 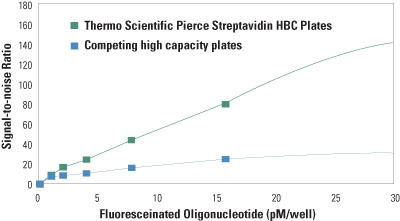 Pierce Streptavidin High Binding Capacity (HBC) Plates are prepared with an exclusive coating method that yields a streptavidin-coated plate with four to five times the binding capacity of other commercially available polystyrene assay plates. Using a Pierce Streptavidin HBC Plate can result in an assay with a broader dynamic range and better linearity, leading to improved assay precision. The plates are offered in several plate formats, plate colors and coating volumes.